The Maverick Volleyball Club has made the decision to withdraw all of our teams from the tournaments where they have to use private transportation to travel outside of the National Capital Region for the weekend of February 9, 2012. The Club will continue to honour our hosting commitments made with the OVA unless the OVA cancels the tournament due to inclement weather. 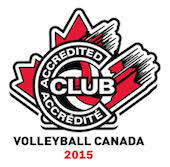 Please consult the OVA's website for up to date cancellations.